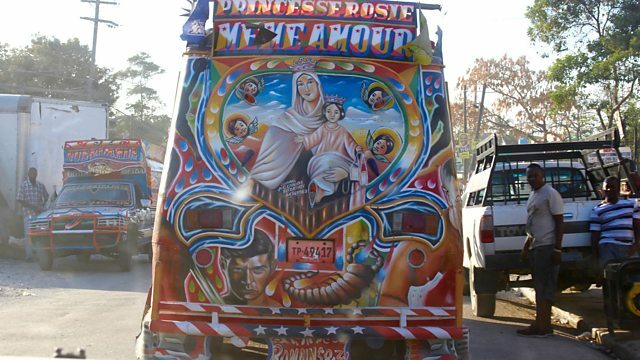 Max Reinhardt's selection includes field recordings from the Haitian capital, Port-au-Prince. Plus tracks from Grimes, Carol Grimes, Helen Grime and grime artist Mr Carmack. More musical adventures with Verity as your guide. Tonight we dip into the sound world of Haiti, with field recordings from Port-au-Prince, including vodou drummers, raucous "rara" marching bands and atmospheric city sounds. Plus 70s Haitian compas fusion from the Caribbean Sextet and a rara-inspired jam from UK saxophonist Tom Challenger's Brass Mask project. Elsewhere in the programme featured artists include Grimes, Carol Grimes, Helen Grime, and grime music's Mr Carmack. And there's also a celebration of the First Lady of Song, the Queen of Jazz, Ella Fitzgerald herself, who was born 100 years ago today. Haiti Direct - Big Band, Mini Jazz & Twoubadou Sounds, 1960 - 1978. Ella In Berlin: Mack The Knife. Spectrum 5, 15 contemporary pieces for solo piano. Performer: Academic Female Choir of the University of Tartu, Vaike Uibopuu. Magi - Tree of Song. Rec 08/03/17 Rhum Barbancourt Distillery, Port-au-Prince. Rec. 08/03/17 Bureau National d'Ethnologie, Port-au-Prince. Rec. 04/03/17 Port-au-Prince International Jazz Festival. Born Again (And The Religion Is The Blues).